The climb from Tschierva hut over Biancograt to Piz Bernina is probably one of the most beautiful climbs in the Alps. 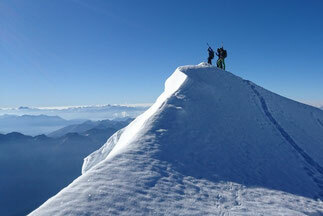 The next day, another highlight follows with the traverse of Piz Palü. Although Galenstock is not a 4000m peak, the silhouette of this mountain can often be easily recognized from far away. The most interesting climbs are for sure those starting from Sidelenhütte with descent on the NE side to Albert Heim hut. The ascent of Matterhorn over Hörnligrat requires a good physical shape, experience with crampons and a good acclimatization. Do you bring this with, then I like to assist you to fulfilling your mountaineering dream. 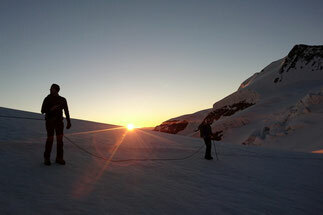 Climbing Gwächtenhorns and Vorder Tierberg are perfect to gain your first experiences in mountaineering. We stay at Tierberglihütte overnight. 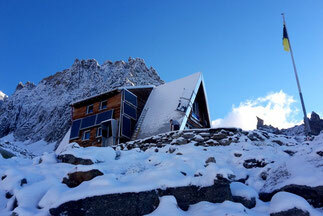 The hut sits on a ridge surrounded by glaciers and rock. Do miss here on my website your mountain of desire? 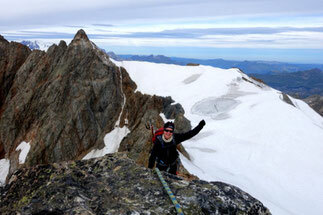 Do you dream of climbing the icy peaks Dom, Weissmies or Weisshorn? 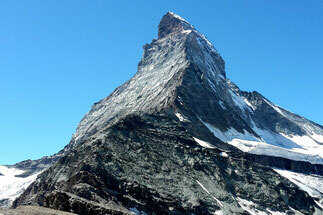 Or are you interested in climbing Eiger over Mittellegigrat? If so, don't hesitate to contact me.